President Salva Kiir publicly apologized to South Sudanese citizens Wednesday for the devastation the past five years of conflict has caused and announced the release of rebel leader Riek Machar's former spokesman James Gatdet, who had been sentenced to death, along with South African citizen William John Endley, Machar's former security advisor, who was sentenced to death by hanging on spying charges. "As your president I want to apologize on behalf of all the parties to the conflict as leadership requires acceptance of responsibility," Kiir told a large crowd gathered at the John Garang Mausoleum for celebrations marking the signing of a revised peace deal last month. "Those of us who considered ourselves leaders must accept the blame collectively and solemnly promise our people never to return them back to war again," said Kiir. 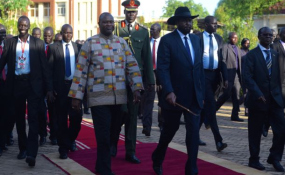 The president told the thousands gathered for the party in Juba that he would release Machar's former spokesman and Machar's former security advisor. "One of them is called James Gadtet. We will release him although he was condemned in court," said Kiir of his former deputy's spokesman. Kiir also promised to free South African citizen William John Endley, who was charged with spying, illegal entry into South Sudan, and conspiracy to overthrow Kiir's government. Kiir said Endley would be released shortly and deported to South Africa. Regional leaders including Sudanese President Omar al-Bashir, Uganda President Yoweri Museveni and newly elected Ethiopian President Sahle Work Zewd attended the celebrations. Kiir called on citizens and all security agencies to welcome Machar and all other opposition leaders back to the country. "In the spirit of promoting peace and stability in our beloved nation I ask you all in welcoming and congratulating Dr. Riek Machar and all the opposition leaders who have shown their commitment to the peace agreement by coming to celebrate with us here today in Juba." Kiir said their presence "is very strong testimony and proof to all that war is ending and a new era for peace and prosperity is breaking." Machar told the jubilant crowd that the SPLM-IO (Sudan People's Liberation Movement In Opposition) is serious about the Sept. 12 peace deal signed in Khartoum last month and his presence in Juba is a sign that he wants true peace. "Why are we here today? If we come after eight months, some of you will say we don't want peace. We want peace. Our heart is on peace like you," said Machar. Wednesday marked the first time Machar has returned to Juba since he fled the country in July 2016 after fighting broke out between his body guards and government soldiers in the capital. Machar is to be reinstated as first vice president in South Sudan's next government. Reverend Abraham Nyari of the Pentecostal church of Juba said the faithful are praying for peace. "We as the church people are praying for peace and we are praying for our leaders, especially the president, to bring peace to South Sudan," Nyari told South Sudan in Focus. Beatrice Abe, a member of parliament, said both Kiir and Machar must keep their promises to end the war. "Let them not break what they put together. Remember, they fought together in the bush and brought this nation [together] and it should not be them to break it apart," Abe told South Sudan in Focus. But Abe remains skeptical about the amount of progress being made in forming the transitional government. "The country is already economically unstable and people go for months without salary and it will take a while for this country to establish. We now have a small government but later we are going to have a bigger government and the resources will all go to maintain the bigger government with little to go for the citizens," Abe told VOA. Dusman Joyce, chairwoman of the Women's Caucus in the National Parliament, said the leaders must show a real commitment to ending the war. "After this celebration, in a few months we need to see that there is free movement of people and humanitarian aid, we need to see the return of the refugees and people are given freedom of speech so that people see that this peace is signed in spirit and letter," Joyce told South Sudan in Focus.